The Pizza Pizza Royalty Corp. (“PPRC”) declares a monthly dividend to shareholders of record as of the month’s end and issues the dividend on the 15th day of the following month. Prior to December 31, 2012, PPRC operated as Pizza Pizza Royalty Income Fund (“Fund”). The following background information provides an historical series of events which led to the current monthly dividend amount of $0.0713. The Specified Investment Flow-Through (“SIFT”) federal tax legislation enacted by the Canadian government in 2007 raised a number of organizational and tax planning issues for consideration by the Fund´s trustees. Effective January 1, 2011, the SIFT legislation imposed a tax (the “SIFT Tax”) on the Fund in respect of the income earned by the Fund and is treating the distribution of such income to investors as an eligible dividend from a taxable Canadian corporation. Return of capital is not subject to the SIFT Tax and is not taxable to investors when distributed to them, but reduces the cost base of their units. The Fund´s trustees decided to retain the Fund´s current income trust structure through December 2012. As an initial step, beginning with the distribution for the month of January 2011, the Fund´s trustees adopted a new distribution policy, with a reduced monthly distribution that reflects the Fund´s obligation to make SIFT tax payments. In determining the level of distributions, the Trustees considered factors related to PPL’s operations, the need to augment the cash reserve fund, future costs of converting to a corporation, their assessment of economic conditions in the PPL’s principal markets, and the discretionary tax deductions that are available as a result of the Fund´s past tax planning strategy. The Fund´s trustees set the January 2011 distribution, payable February 15, 2011, at $0.0584 per unit or $0.70 annually. At this level, the eligible dividend portion of the Fund´s distribution combined with the return of capital component of the distribution will provide taxable Canadian individuals with an effective after-tax yield comparable to current levels. Since 2011, the Fund/PPRC increased the monthly dividend seven times: first in May 2012 by 2.7%, then in January 2013 by 4.2%, and in June 2013 by 4%, again in January 2014 by 2.6%, April 2015 by 1.9%, November 2015 by 2.5% and most recently in June 2016 by 2.4%. 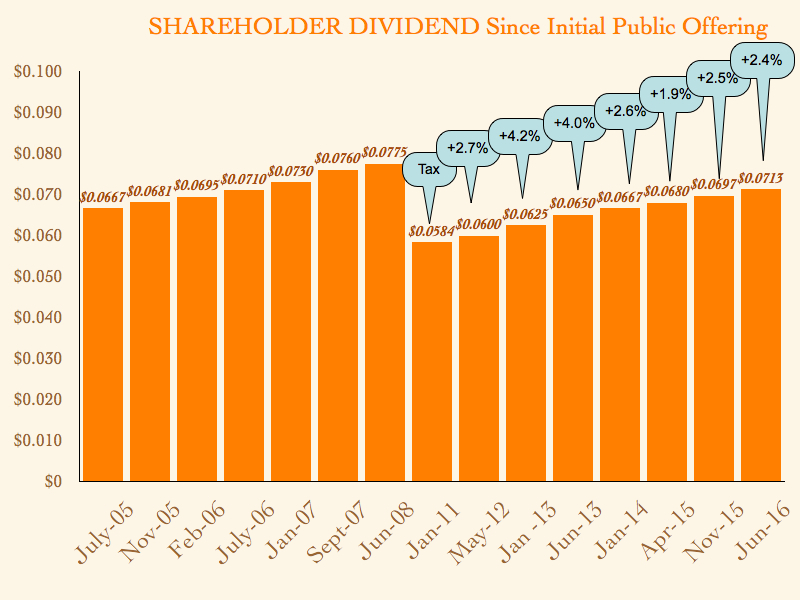 The current monthly dividend is set at $0.0713 per share or $0.8556 annually. The dividend increase reflects the strong quarterly results, positive same store sales growth, and growth in the working capital reserve.